Review: After all these years of going to the movies it took The Wind Rises to finally get me to ask myself the question…can you truly appreciate a movie and not wholly like it? If so, then legendary Oscar winning animator (and driving force behind Japan’s animation juggernaut Studio Ghibli) Hayao Miyazaki has wrapped up his storied career with a highly respectable and deeply personal tale that’s free of the whimsy of fantasia found in his early work and one that’s more grounded in historical reality. Though the film is a highly fictionalized work, its central character Jiro Horikoshi was no figment of Miyazaki’s imagination. Known today for creating the Zero fighter plane, Horikoshi served as chief engineer of many of Japans fighter planes during World War II. Miyazaki takes the idea of the character of Horikoshi and his life’s work and fashions a biographical tale that has its share of moments that soar into the heavens but more often than not feels too earth bound. A story that could have (and should have? and will?) be told as a live-action film, it falls victim to the Miyazaki style of animation favors featureless characters that unfortunately all start to blend together after a while. Even the animals have odd human-like faces that are more than a tad off-putting for a picture that seems to resist going for a mythical element as is found in Miyazaki’s Spirited Away or My Neighbor Totoro. Yet even though Miyazaki is going for something more naturalistic, he finds ways to let his imagination run wild such as in the sequences of Horikoshi’s dreams that find him commiserating with Carponi, an Italian aeronautical architect who conjured up some awe-inspiring designs for the future of travel. Accompanied by a soundtrack made up of human voices that stand in for an orchestra or sound effects, these passages may be cool to the touch but are warm in spirit. Between earthquakes, sickness, the threat of war, and a love affair with a girl from his past, Horikoshi’s story is revealed in metered bits that somehow manage not to feel choppy or overly episodic. As with most of Miyazaki’s work, the film runs over two hours and this one feels like it…so I could have done with the film clocking in twenty minutes shorter. Even so, the value of seeing the final work of Japan’s master makes it worth the extra time in your seat. 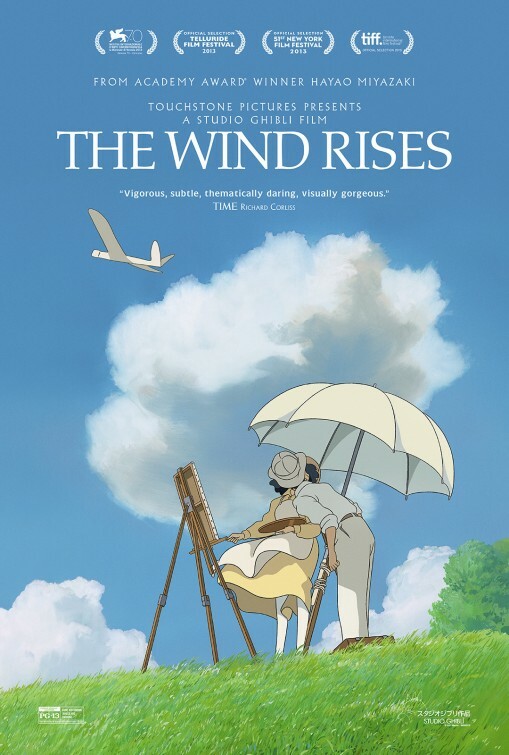 Nominated for Best Animated Film at the 2014 Oscars, several theaters will be showing The Wind Rises in its original subtitled version or in a dubbed edition for those that are averse to hearing a film in its native tongue. I saw the film with the voices of Joseph Gordon-Levitt (Don Jon), Emily Blunt (The Five Year Engagement), John Krasinski (Promised Land, Big Miracle), Martin Short (Frankenweenie), Stanley Tucci (The Hunger Games: Catching Fire), and Darren Criss (Girl Most Likely), though none of the Hollywood voices add much to the mix. A work to be respected, I’m still not sure if I truly liked the film. It’s slow and a bit of a slog to get through. Still, like walking through a museum of fine art, I came out of the screening appreciative to have taken the journey. Its a beautiful piece of work, a tad long and stretching it out but still, when the credits roll, I felt like I already know I’ll miss Miyazaki and the beauty and details his animations always offer to the audience!